Three Tree Point Bed and Breakfasts New Web Site. We have just released our new website with large photos and some new promotions. Please test or call if you have any questions we can help you in planning your vacation. Want to do it in style or for a new perspective!! 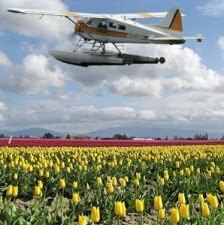 Kenmore Air is offering a special 1/2 day flights. This Blog is about thing my guest enjoy doing during their visit to Seattle. Please read, enjoy, comment and add.